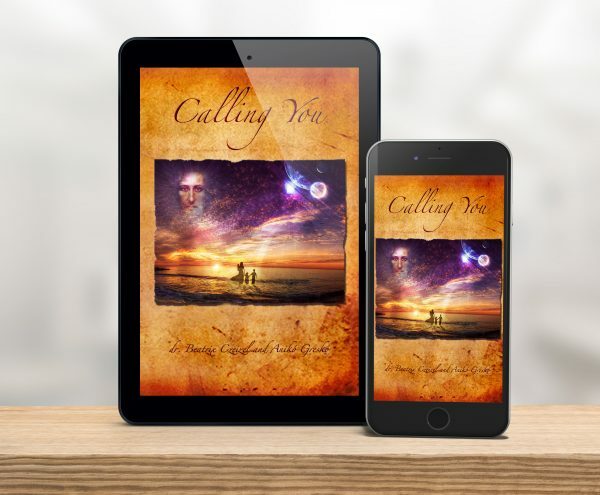 We would like to announce that our beautiful book ‘Calling You’ has started on its way towards all those hearts and souls all over the world who can be open for the mysterious Message of the Christ Soul, Mary Magdalene and their new Gospel to help everyone on their way towards Redemption. It is available both in exclusive hard cover printed version and in the form of ebook (pdf, mobi). “The dearly held hope we had carried for a very long time was that the Christ Soul would speak to us again Himself and tell us the stories of His earthly paths, reveal the secrets of His real story; the details of the life and fate of Jesus, His relationship and marriage with Mary Magdalene, their true experiences, all that has been silenced and omitted from the Bible, too – due to the official mind-manipulation by the Church and the Vatican – and teach us by sharing His own inner truth beyond the scripts, dogmas and traditions of the Church. The revelations of the Christ Soul, the Heavenly apostolic community, the members of the Holy Family and the related initiations already began with our Celebration of Light on 17 August, 2011. The next one and a half years were spent in a special reclusion, as if we had entered the silence of a secret inner cave to make that special mystery happen again in which we could meet the Christ Soul and the members of the Holy Family. In the birthing of this book, it felt as if the Christ Soul and the members of the Holy Family returned from the stars to entrust us with a long-forgotten gospel. It came to us like an epic woven from the long chain of Light messages, with the purpose of sharing the present-time Message of the Christ Soul with today’s humanity and thus creating a New Gospel. Not instead of the old ones of course, but in addition to them. Beautiful secrets were revealed, reflecting the real relationship between Jesus and Mary Magdalene as the fulfilled fate-mirror of an intimate human and spiritual connection. This new perspective on their relationship enables us to understand the motivations of their mission, the personal secrets of their relationship and the mystical depths of the lives that were born from their sacred union. This book offers an opportunity to immerse in the essence and the inner experience of Christ Consciousness. Of course, the “Christ Consciousness” does not require any religious commitment and it is not the same as the doctrines of traditional Christianity. In fact, it differs from that in many aspects, so this notion of Christ Consciousness should be understood more like a living and practical quality and ability of the heart, which can make a human being capable of operating the attributes of all the Seven Wisdoms of Christ simultaneously, in every minute and every direction of his or her life. Everyone who comes in contact with this book and intends to complete this initiation pathway will be lifted up in a certain sense into the shelter of the celestial Mystery School residing among the stars of the Big Dipper to experience the secret of the seven mysteries of the Christ Consciousness, step by step, so that the seven Christ seeds should be awakened in his or her heart. Following this spiritual pathway requires you to step up a steep staircase that clearly leads to a Heavenly Temple, shining in golden light. Each chapter is a step of that staircase, so no stair can be skipped or omitted because each step is built upon the other, reflecting a very serious heavenly intention and following the inner laws of an exceptionally powerful initiating pathway. We would like to add that after you have already completed this journey, once or twice, travelling together with us across the pages of this book, then this living book can become your companion. In fact, it can turn into a certain divination tool for you, which you can open to a random page sometimes, when you are searching for the answer to an important question or if you are troubled by doubts or feel weakened in your faith or love. This book can be everyone’s because the Grand Master of the collective fate alternative of the Ascension is none other than the Christ Soul, who is working on the redemption of each and every inhabitant of the earth. He comes for all of us, to help us through the mysteries of mercy whether we believe in Him or not. Let us be together the true hearted messengers of this sacred teaching and let’s create together that this Gospel of the Heart reach as many people on this planet as it can! For me this is the most wonderful Book in the world. We get the stories and teachings, which are on my opinion indispensable in our lives, with crystal clear voice and words. Finally we learn the Truth, which brings our heart and soul beautiful intimate experiences, deep revelations, healings and relief. It’s wonderful and almost magical to experience and feel how these beautiful stories speak straight to our heart (like all the Books, all the Messages of the Stars and the Poems of the Authors), and meanwhile to us, to ordinary people, to everybody. As we feel into them, we recognize important life situations, and we can heal and learn through them as deeply as we have not experienced it before about ourselves, about each being in the surrounding world, about the Life. How is it worth to live it. This Book is an indescribable big Treasure for our World! We deeply thank for the tireless work, for every piece of memory and the opportunity for the True, Loving life, for the way to the Ascension together, here on Gaia! I heartily recommend this Book to anyone who feels the Calling.